Gloucster Castle had a chequered life over more than 30 years, built in 1911, requisitioned as a Hospital ship in 1914, torpedoed in 1917, towed home for repairs, served in WW2 until 1942, only to be sunk by the German Armed Merchant Raider Michel. Built in Scotland in 1911. Gloucester Castle built by the Fairfield Shipbuilding and Engineering Company of Glasgow in 1911 for the Union-Castle Mail Steamship Company. Her tonnage 7999 GRT, a length of 450 feet and 7 inches with a beam of 56 feet 2 inches, her speed, a humble 13 knots. Commissioned as a 410 bed hospital ship on the 24th. of September 1914, April the next year found her serving in the Dardnelles campaign. Because of her meagre 13 knots speed, the ship gained the name of GO SLOWSTER CASTLE, come 1939 she was laid up at Netly in Southhampton Water. Gloucester Castle torpedoed 30th. March 1917, in English Channel, Her Red Cross well in evidence on her hull. Saved to be towed to England, and serve again in WW2. On the 21st. 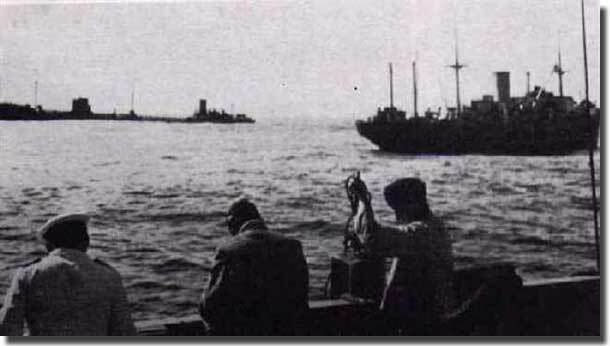 of June 1942 the ship was back at sea, and she sailed out of Birkenhead, only to run into the German Armed Merchant Raider Michel off the Ascention Islands on the 15th. of July. In the ensuing action which sank her, from her 154 people on board, 82 crew, 6 women, 3 men, and 2 children all passengers, died. 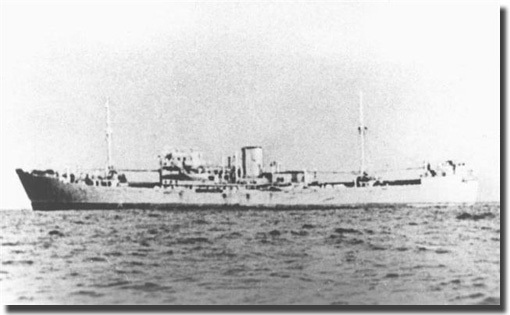 The remaining 57 survivors were taken aboard the German supply ship and tanker Charlotte Schliemann, to wind up as prisoners in Japan for the next 3 years. Charlotte Schliemann on the left with the Speybank, renamed Doggerbank. Gloucester Castle survivors were put aboard Charlotte Schliemann and transported to Japan. After a long service spanning over 30 years, Gloucester Castle finally ran out of luck when she was stopped by Michel. The Raider's Captain, Helmuth von Ruckteschell was tried for war crimes at the end of WW2, and in 1946 was imprisoned at Spandau. on the 15th. of July 1942. 93 crew and passengers were killed in this action.